This is a follow-up press release for an ongoing story of new actions taken. This story was originally covered by WYMT-TV, a CBS affiliate. Joshua Melton and James Raymond Feltner, a married couple, were unlawfully evicted, assaulted, and sued in Manchester, KY. During the illegal eviction, the landlord stated she "should not have rented to faggots." 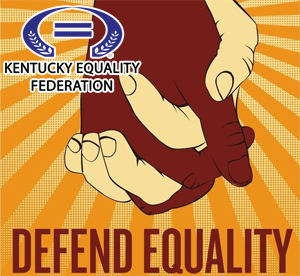 At Kentucky Equality Federation, we assist and act as a public advocate for people who have been bullied, discriminated against, or victimized in addition to assisting them with legal remedies. When the laws have not caught up to the moral needs of society, we will seek their modification, pursuant to the creation of a just society. However, laws cease to have meaning when the courts are not capable of or refuse to enforce equal justice before those laws. (original press release, also covered by WYMT-TV, a CBS affiliate). "It is my belief that homophobia in a close-knit political community has resulted in Judge Allen B. Roberts ruling contrary to Kentucky law and advancing his own personal beliefs, presiding over a self-serving court of deceit, hypocrisy, and belligerence," stated Secretary-General Jordan Palmer. "In 16 years of activism, I have never heard a judge be so demeaning, unprofessional, and completely hostile. As with everything in life, eventually, we must take sides, and I do so diligently. Remaining uninvolved encourages the bully. Failure to raise your hand in protest and remain silent not only makes you part of the problem, but it encourages the discriminating person, agency, or government. 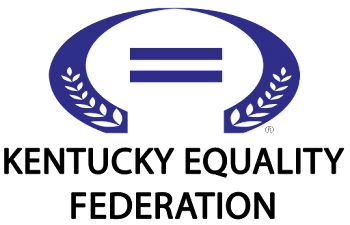 When basic fundamental civil rights are denied, suppressed, or persecuted, we all have an obligation and a duty to create a hindrance or an obstacle. When you are given a ticket for something or arrested, the standard police response is “ignorance of the law if no excuse, nor is it a defense." Conversely, anyone ignorant of the law is also doomed to have their civil rights trodden on, so it behooves the Commonwealth’s citizens to be fluent in the law and we encourage all citizens to read the Kentucky Constitution and to know their rights for no law made can supersede the Kentucky Constitution, not even a constitutional amendment if said amendment violates the Kentucky Constitution, regardless of the ballot outcome, as with an amendment (Kentucky Equality Federation v. Commonwealth of Kentucky)." "Officials in Clay County have tried to silence Secretary-General Palmer several times without success for being the personal advocate of the victims, after the initial court hearing for the counterclaim of the victims," stated Eastern Kentucky Regional Director Matt Berry. "It is indeed a sad day in our commonwealth with the Office of County Attorney, attempts to keep any victim from filing charges or seeking justice when they have been wronged. Equal housing rights are human rights." Ms. Thompson reportedly told the Victims "she should have never rented to faggots." "History has shown that neither Jordan Palmer nor this Federation will be silenced by self-serving, egotistical want to be tyrants with delusions of adequacy or power. On multiple occasions, the FBI has directed other victims to contact the Federation so that we could initially review the complaint (Milam v. Warren County Regional Jail – Kentucky Equality Federation’s legal representation at the time filed the case and won)," stated Southern Kentucky Regional Director William Taylor. Palmer continued: "Any licensed attorney or an ordinary citizen knowing the law could argue that the presence of police, at the request of a city commissioner, was intimidating and any statement made by a uniformed law enforcement officer and communicated to the Victims to be the actual law in fact. (i.e. A uniformed police officer tells a citizen they could not walk on a public road, the citizen will comply and not walk on it, even though they would have every legal right to). How Judge Roberts could not make this connection is beyond our sphere of comprehension in an unbiased court of law. One police officer reportedly told them, “they must leave by the time given to them by Esther Thompson,” their landlord and community manager (who at the time was also a City Commissioner). The notice to vacate immediately was verbally ordered by Thompson and reinforced by Manchester Police Department Officer Couch. This was all the notice the Victims needed as the order to vacate as well as the time frame was reinforced by uniformed law enforcement. Prior to this, Thompson illegally entered their apartment by forcing her way inside. Had the Victims chosen to defend their home, the Victims could have wounded the intruder under the U.S. Castle Doctrine, in Kentucky law known as KRS 503.055, something Judge Roberts completely dismissed." The husband of Esther Thompson is the person that was responsible for installing carpet and other repairs inside the apartment they vacated. Judge Roberts did ask to see multiple bids or quotes. This is a major conflict because Esther Thompson stood to further profit by inflating damage and repairs and Judge Roberts did not bother hearing testimony from all the witnesses that showed up to testify in support of the Victims including witnesses present when Esther Thompson illegally forced herself into their home. Kentucky Equality Federation Managing Director Joshua Koch stated: "The presence of police, at the personal request of a city commissioner, was a use of public office for intimidation. There are numerous other possible issues involved here, as well. They include fiscal conflict of interest, residence invasion by force, assault, and use of public office for personal for personal gain. To have these concerns dismissed is the antithesis of justice. Additional witnesses are prepared to testify on behalf of the victims. We feel the gravity of this case and its egregious handling by local court warrant review by the U.S. Department of Justice, the Kentucky Office of Attorney General, the Kentucky Bar Association, and the Kentucky Judicial Conduct Commission. The initial offense is a violation of individual rights, but having a further denial of justice or a fair hearing demands a level of professional accountability from Judge Roberts that warrants further review, as it is an offense against all Kentuckians who must rely on these courts to provide impartial justice." 2:00 PM EST UPDATE: Today the Sheriff's Office still had not served all witnesses resulting in another delay. The Special Prosecutor demanded by the Kentucky Equality Federation continues to subpoena them but they are never served. Why have bench warrants bit been served on these witnesses? The judge will not issue them because the sheriff will not serve them.